Lately Jack Bowen had taken to wearing the chicken suit in the morning. He’d get to work early, before the others arrived, lock the door of his prefab office, take the suit out of the cupboard where it had hung all those years and slip it on, just for a few minutes. So where was the harm in that? The yellow plumage was a little ratty now and when he put the head on the beak sagged forlornly as he strutted up and down flapping the stubby wings. All the same, it felt good; took him back to the old days when he and John Tully were the top dogs at Lomax Ford, beating the sales target every time and picking up the cut glass decanters and all the other trinkets at the end of the month when the figures came out. Jack had bought the Wurlitzer to hang onto the same memories; picked it up caked in dirt at a junk auction, cleaned it up good as new until the chrome and plastic gleamed. When Betty finally got exasperated and threw it out, he’d brought it to the office, and in his lunch break would plug it in and watch the coloured lights flicker up and down the tubes; press one of the buttons from which the paper slips with the song titles had long since disappeared and feel the thrill of anticipation as the selector arm plucked a 45 from the stack and placed it on the turntable, the needle going down…Ricky Nelson singing “My babe”. Those were the days. When Big John Tully took the UK Ford Salesman of the Year Award for the third time running he’d put on his big confident smile and told Jack: “Jackie, kid, we’re wasting our talents busting a gut for Lomax when we could be coining it for ourselves!” Gone straight out and sweet talked the bank into a loan to buy Stan Gifford’s place on The Old Kent Road; clinched the deal on the strength of poaching a fair chunk of the Lomax trade. That was John all over, the wheeler-dealer, and Jack, who’d always played straight-arrow to this flamboyant showman, leafing through the Glass’s Guide and shaking his head whenever a punter grew over optimistic, had naturally thrown in with him. “Ha-ha Jackie boy, we’ve got it made,” John told him in his booming voice, arm thrown around his shoulder, “you and me, kiddo, we’re set up for the good life.” And so they were in those distant days before Tully went over the top, took to wearing cowboy boots and watching John Wayne DVD’s on a giant home cinema rig he’d set up in the back room, leaving Jack to run the business; before he named his only son after the Duke; before he snuffed it on the day Jack sold a blinged-up Bentley to a minor Saudi royal and Tully overdid the celebration; choked himself to death on a T-bone steak with pepper sauce. Finally I get this ebook, thanks for all these The Chicken Suit I can get now! 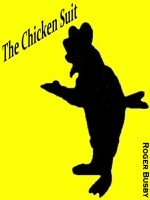 The Chicken Suit was the best books I ever buy. The Chicken Suit did exactly what you said it does. I will recommend you to my colleagues. The Chicken Suit is the most valuable books we have EVER purchased. I'd be lost without this. I am completely blown away.